St Francis Bay is a picturesque holiday village lying at the gateway to the Garden Route, one of South Africa's premier holiday destinations and an hour's drive from the city of Port Elizabeth. The bay was first sighted in 1575 by a Portuguese sailor who named the area St Francis after the Patron Saint of Sailors. The climate is temperate with warm summers and mild winters. The Kromme River borders the one side of St Francis Bay, and is navigable for six miles (10km) upstream from the river mouth. The river and river mouth are popular with fishermen, boaters, canoeists, windsurfers, kite surfers and marine creatures which shelter in its waters. Linked to the river is a magnificent marina lined with white, thatched homes, some of which offer bed and breakfast accommodation. Canal cruises at sunset are popular here or else one can enjoy drinks or a meal at a restaurant overlooking the canals. Port St Francis, a small harbour resort village, lies in a sheltered nook of the bay and provides a colourful setting and safe anchorage for calamari boats, pleasure craft, and ocean going yachts. 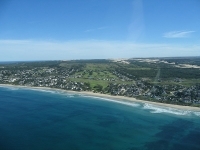 Cape St Francis, a rustic fishing village, sits adjacent to St Francis Bay. Cape St Francis is popular for surfing at Seal Point, its beautiful long stretch of beach, and the historic lighthouse built in 1878. Walking trails wind along the rocky coast, through the Irma Booysen Floral Reserve, and along the Cape St Francis Point, linking it to the village of St Francis Bay. The village has several small shops and art galleries that will cater to almost all your needs and ensure that you find some souvenirs to take back home. There are at least two fair sized supermarkets which will provide all your basic requirements. In high season most of the shops are open seven days a week. St Francis Bay has a wide variety of restaurants and coffee shops that offer a reasonable selection of meals. Most restaurants in South Africa have a reputation for good food at affordable prices and St Francis Bay is no different. Most of the restaurants focus on seafood, with local calamari being a menu highlight. Eating out is popular and the restaurants and bars offer an opportunity to sample the large range of South African wines, which are very affordable in comparison with other countries. Nearby Jeffrey's Bay provides a much bigger range of nightlife options for those truly determined to party. During the December summer holiday season St Francis hosts a few big outdoor live music events and parties which are very popular with youngsters. Whales can be spotted in the bay from May to late October and dolphins can be seen almost daily on their way back and forth between Cape St Francis and Jeffrey's Bay. The Cape Clawless Otter is also indigenous to the area, and can be spotted frolicking in the waves and rock pools around the Port of St Francis area and at Otters Landing. Nature lovers can enjoy the hiking trails meandering through the nature reserves and along a dune river system, with its unique landscape, where you can view the area's 'Fynbos' (fine leafed indigenous plants) and see antelope roam freely. Over 200 species of birds have been recorded including the rare African Oyster Catcher and magnificent Fish Eagle. St Francis Bay also has two 18 hole golf courses: St Francis Bay Golf Course and the St Francis Links, a Jack Nicklaus Signature Course. The Addo Elephant Park, situated in a malaria free area, is a mere hour and a quarter's drive from St Francis Bay and offers the best elephant viewing in the world. Cape St Francis and the nearby Jeffrey's Bay are both fantastic surfing destinations. Outside of the peak summer season, St Francis doesn't have much of a nightlife. St Francis can be windy, so a windbreaker is essential.